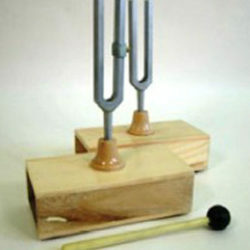 Resonance and beat demonstrations can be undertaken with this pair of tuning fork resonance boxes. Resonance and beat demonstrations can be undertaken. One fork responds to the other showing how sound waves create sympathetic vibration over distance. Using the adjustment weight, the mass of one of the forks can be adjusted for beat experiments. 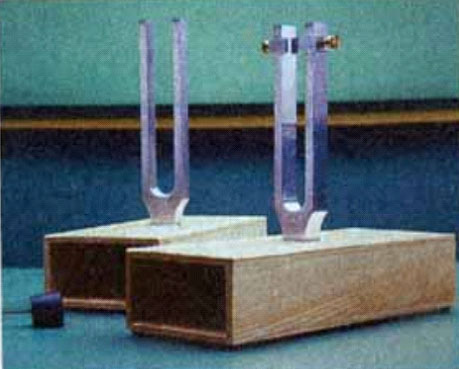 Two aluminium forks mounted each on a resonance box. Complete with adjustable weight and hammer. The tuning forks are of different lengths 19.4 cm & 17.5 cm approx. The tuning fork which is non adjustable is of 256 Hz. 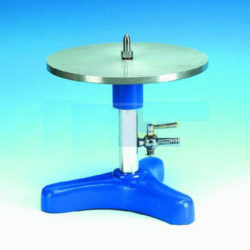 The other one can be adjusted over a range of 30 Hz with the adjustable weight provided. When the upper end of the weight is aligned with the notch on adjustable tuning fork, the frequency is near to 256 Hz and resonance occurs. Vacuum Pump Plate 200mm diam.